It’s hard to quit smoking. Trust us, we know. Half the battle is wanting to quit in the first place. Once you do, the other half is mostly fighting with yourself until enough time goes by that food tastes better, and life looks longer. [Danko] recently quit smoking. And because idle hands are Big Tobacco’s tools, he kept himself busy through those torturous first few days by building a piece of pocket-sized motivation. This little board’s main purpose is to help him root for himself by showing the time elapsed since his final cigarette, the number of cigarettes he has avoided, and all the money he’s saved since then. At the press of a button, he can reflect on the exact moment he took the plunge into Cold Turkey Lake. Sure, there are apps that’ll do the same thing. But anyone who’s ever tried to quit smoking knows how important it is to stay busy every minute while your brain deals with the lack of toxins. It runs on an ATtiny85 and a DS1307 RTC chip. Looks to us like [Danko] adapted a board from a different project, and we love it when that’s a possibility. Not a smoker? Good for you. The next hardest thing humans motivate themselves to do is exercise. That’s a lifelong battle that can definitely be improved with some gamification. We love custom clocks here at Hackaday, and are always thrilled to see each inventive means of time-keeping. In a seldom-seen take on the familiar device, the [Bastel Brothers]’s LED Strip Clock’s sleek profile finds itself in good company. The clock is a two-metre strip of 60 LEDs; every minute past the current hour corresponds to one lit LED, every fifth LED is turned to red in order to make reading minutes easier. So 3 red LEDs +3 green LEDs=18 minutes, with the hour marked by a third color. Sounds complex, but the [Brothers] are quick to say you get used to it quickly, especially when the 6 o’clock LED is centered at some noticeable object or feature. There’s no shortage of Arduino-based clocks around. [Mr_fid’s] clock, though, gets a second look because it is very unique looking. Then it gets a third look because it would be very difficult to read for the uninitiated. The clock uses three Xs made of LEDs. There is one X for the hours (this is a 24-hour clock), another for the minutes, and one for the seconds. The left side of each X represents the tens’ digit of the number, while the right-side is the units. But wait… even with two segments on each side of the X, that only allows for numbers from 0 to 3 in binary, right? [Mr_fid] uses another dimension–color–to get around that limitation. Although he calls this a binary clock, it is more accurately a binary-coded-decimal (BCD) clock. Red LEDs represent the numbers one to three. Green LEDs are four to six. Two blue segments represent seven to nine. It sounds complicated, but if you watch the video, below, it will make sense. World Maker Faire was host to some incredible projects. Among the favorites was Nixie Rex [YouTube Link]. Nixie Rex is actually a Panaplex display, since it’s glow comes from 7 planer segments rather than 10 stacked wire digits. One thing that can’t be contested is the fact that Rex is BIG. Each digit is nearly 18 inches tall! Nixie Rex was created by [Wayne Strattman]. Through his company Strattman Design, [Wayne] supplies lighting effects such as plasma globes and lightning tubes to the museums and corporations. Nixie Rex’s high voltage drive electronics were created by [Walker Chan], a PHD student at MIT. 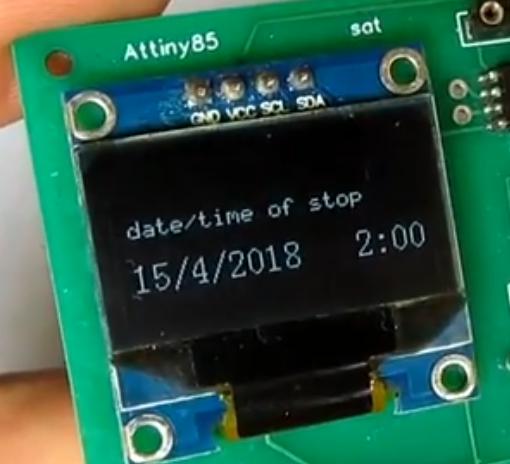 Believe it tor not the entire clock runs on an ATmega328P based Arduino. 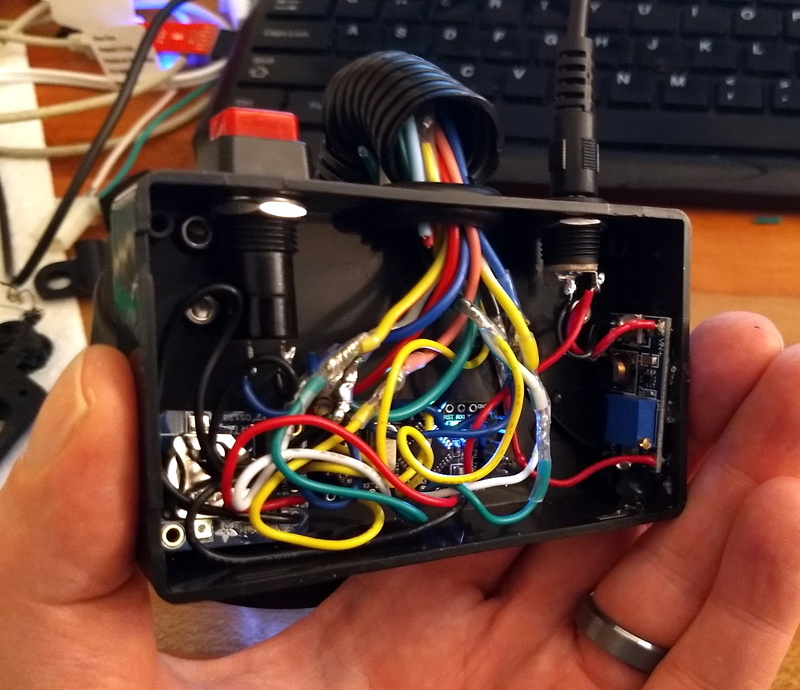 The digits are daisy chained from the arduino using common Ethernet cables and RJ45 connectors. A Sparkfun DS1307 based real-time clock module ensures the Arduino keeps accurate time. [Wayne] and Rex were located in “The Dark Room” at Maker Faire, home to many LED and low light projects. The dim lighting certainly helped with the aesthetics, but it did make getting good photos of the clock difficult. Long time Hackaday tipster [Parker] graciously provided us with a size reference up above. Click past the break to see a closeup of that awesome cathode glow, and a video of the Nixie Rex in action.